I have always been obsessed with vintage French linen. Now mostly found in the attics of old french chateaux's and the cupboards of textile enthusiasts, I am drawn to its slubby softness and irregular weave and I am always on the lookout for a pretty little bundle. I dream of an old armoire stacked high with piles of neatly folded linens, interspersed with soft, floppy lavender bags and tied with ribbons and twine. I spend a LOT of time hunting out the real deal, and if I find a piece with a red stripe and a hand embroidered initial thrown in there and I am near passing out with joy. Naturally, lots of the gifts and cards for sale at Verity & Thyme this Christmas have been made from treasured pieces I have saved up for my favourite time of the year. I have spent many a chilly autumn evening hand embroidering festive motifs onto tea cosies and cards, and have not been surprised that both these and the embroidered lavender pillows have flown out the door as fast as I can make them! 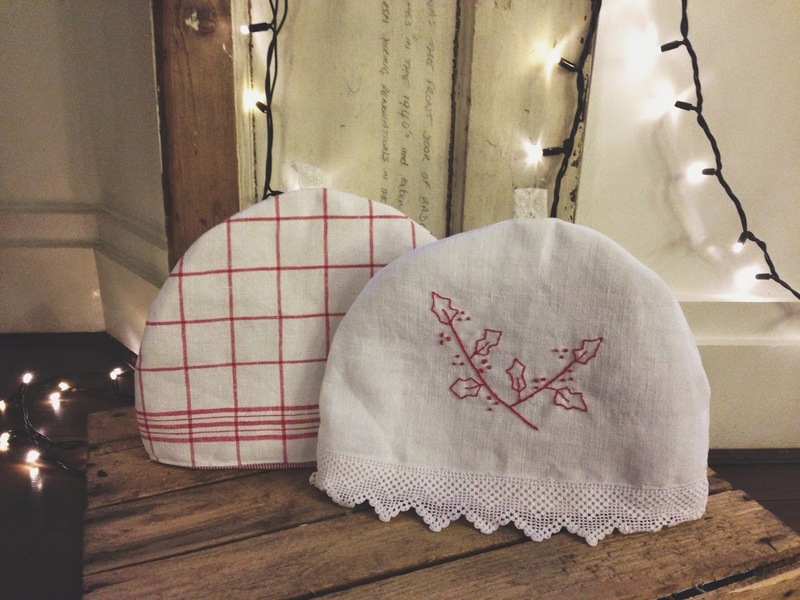 For the tea lover in your life, one of the jolly hand embroidered french linen tea cosies would go down a treat this Christmas and with a limited supply left at the pop up, you best snap one up quickly. Made from a vintage french linen sheet and trimmed with handmade french lace, they will look pretty as a picture next to the Christmas cake this December. The lovely soothing scent of lavender is one of my favourites, and this natural relaxant fills the little plump pillows seen above. 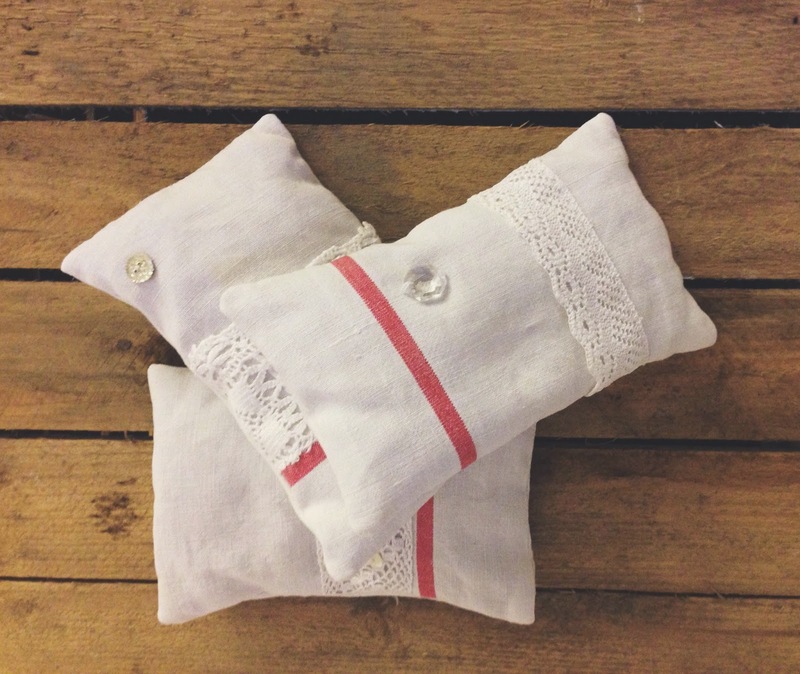 Made from old french linen tea towels and adorned with handmade lace and a button (either a 1930's glass button, mother of pearl or a piece of a vintage chandelier) they make lovely stocking presents, perfect for placing on your pillow before you go to sleep. Alternatively pop in a drawer or wardrobe and enjoy it all day long as it lightly scents your clothes. 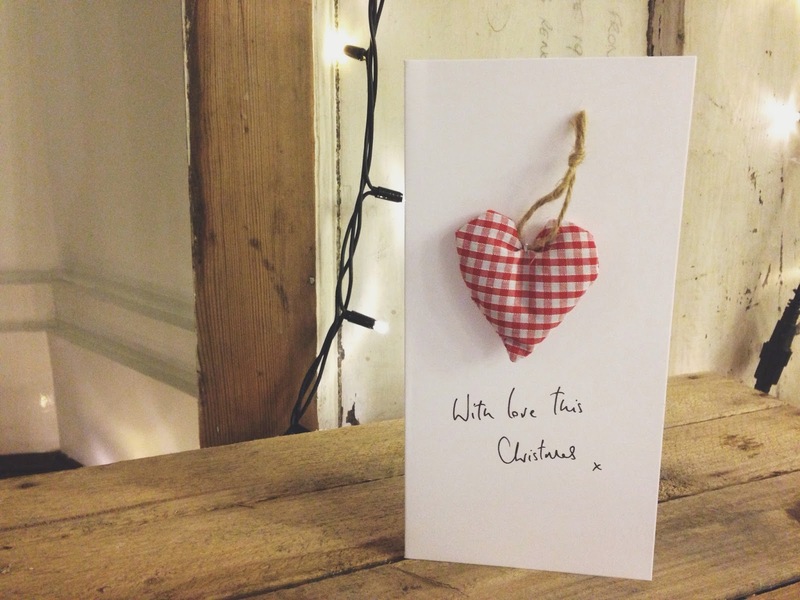 Also filled with lavender are the stocking and heart handmade cards. 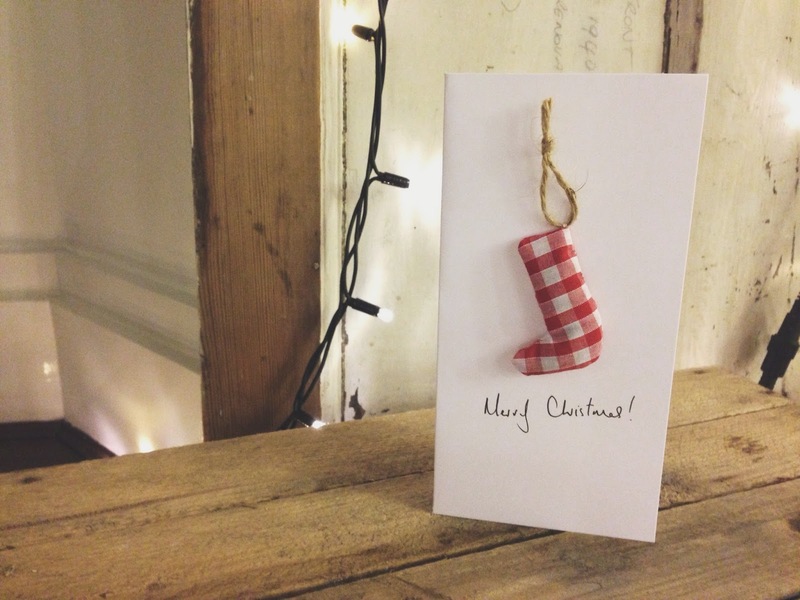 The perfect card-gift combination, the sweet little stocking or heart can be taken off the card and hung as a decoration on the tree or a door handle to be enjoyed all year round. The lavender is grown by the lovely people at Long Barn in Hampshire, as I believe it is important to support our very own hardworking farmers here in the UK. 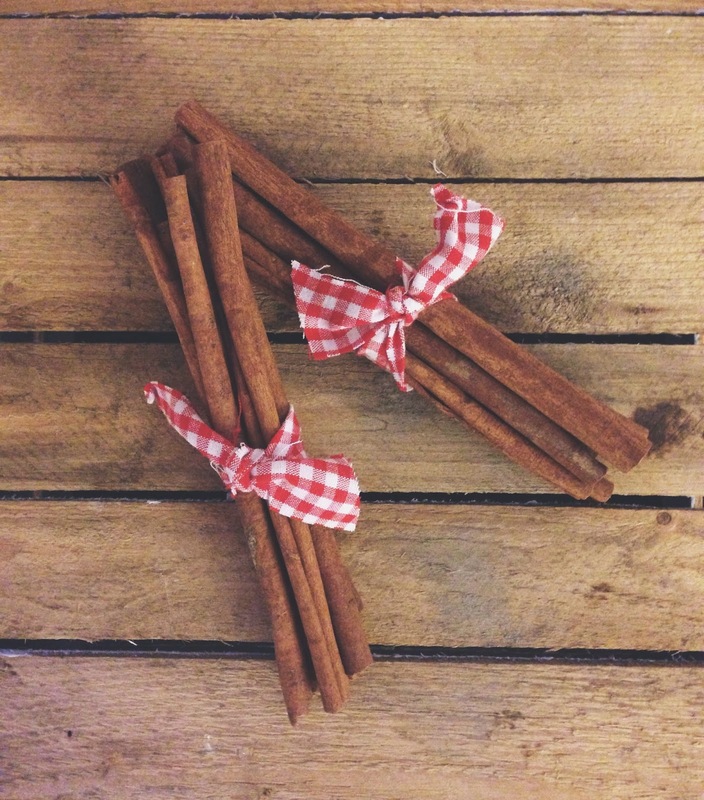 And finally, tied with ribbons on festive red and white check linen from the 1930's, these lovely long cinnamon stick bundles are ready to be placed on the mantlepiece or the Christmas table to release their warming scent. Don't forget the pop up will be open over the weekend too as Oh Me Oh My serve up lots of festive afternoon teas on Saturday and Sunday, so pop in and pick up a few one-off gifts for your loved ones! There is also still time to order a lovely fresh festive arrangement or two for the ladies in your life, but if you can't make it this weekend then pop your details in an email and I will get back to you.